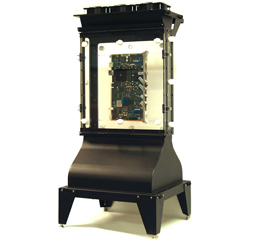 The BWT-104™ is a research quality, open loop, bench top wind tunnel for thermal characterization of components, circuit boards and cooling devices such as heat sinks, heat exchangers and cold plates. The polynomial shape and internal flow management system includes honeycombs and screens to break up turbulence to provide uniform, homogeneous flow, up to 4 m/s (800 ft/min) within the test section. The BWT-104™ has 18 ports which allows a variety of probes, such as thermocouples, Pitot tubes, and temperature and velocity sensors, among others, to be inserted throughout the test section. The wind tunnel is made from aluminum and Plexiglas®, to provide a clear view of the test section for flow visualization. Rail guides are provided in the test section so the board (PCB) in the test position can be adjusted. An access panel is conveniently located for mounting boards. The mounting of the boards can be adjusted in three different directions (i.e. spacing from the walls can be adjusted using appropriate stand offs. The BWT-104™ weighs only 21 kilograms (47 lbs.) making it ideal for laboratory environments. Each fan tray is equipped with three 24-volt DC fans, which can be individually switched on and off through a control unit for simulating fan failure simulation. The BWT-104™ can be equipped with ATS’ WTC-100™ automatic controller to facilitate testing without attendance. The combination of BWT-104™ and WTC-100™ can expedite and automate testing programs such as component or heat sink thermal characterization, PCB thermal simulation and others that can be time consuming. ATS also carries a full line of temperature, flow and pressure sensors and scanners.